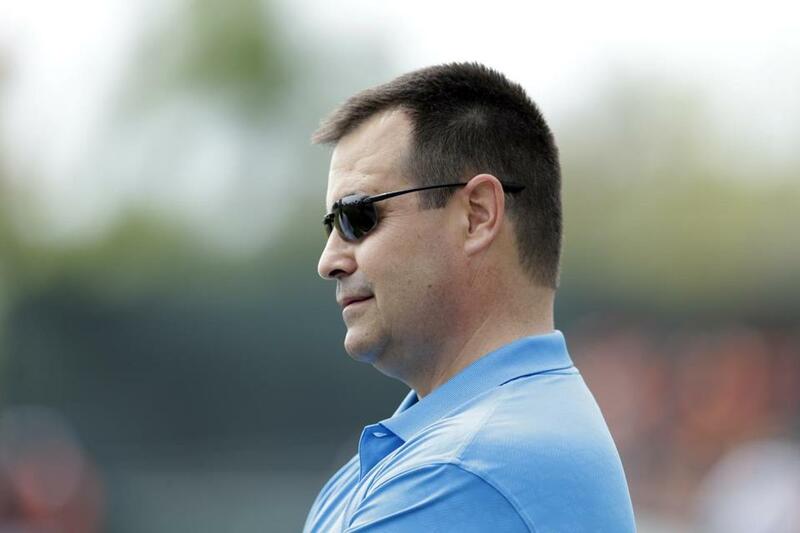 Dan Duquette, fired by the Red Sox in 2002, has found a new home in Baltimore. It was almost 10 years after he was fired by the new Red Sox ownership that Dan Duquette got back to running a baseball team. That time gap — all of which was spent out of baseball — usually does not yield a general manager job for a high-profile team such as the Orioles. But for Duquette, it was the same job, different year. He brought back some of his old Red Sox staff — Lee Thomas as his right-hand man, Ray Poitevint as his Pacific Rim scout, Fred Ferreira (who actually worked for him in Montreal) as his Latin American scouting supervisor, and Gary Rajsich as his scouting director. Duquette brought back Kent Qualls as his minor league coordinator, as well as trainer Chris Correnti, who was instrumental in the success of Pedro Martinez and Derek Lowe. So many baseball people thought when the Orioles lost catcher Matt Wieters to Tommy John surgery that the season would be lost. “I remember when we lost [Jason] Varitek in 2001, that was rough,” Duquette said. “When we lost Wieters we had to act quickly to replace him. [Scout] Dave Engel recommended we take a look at Nick Hundley. We obtained him, and he and Caleb Joseph have done a remarkable job of handling our staff. Duquette, who last year received a contract extension through 2018, as did Showalter, said he always thought he’d get back into baseball. He had turned down opportunities for lesser positions along the way because “I just wanted to run a baseball team again.” He said he started looking in earnest about four years ago after his youngest son finished high school. And that led him to an interview in 2012 with the Angels for their GM job, which went to Jerry Dipoto. After Toronto assistant GM Tony LaCava turned down the Orioles job following Andy MacPhail’s departure, Duquette was brought in, and he convinced the Angelos family that he could do the job. It’s obvious Duquette doesn’t have the budget John Harrington gave him in Boston. In Boston, Duquette was able to acquire Martinez from the Expos and then sign him to a long-term deal as Roger Clemens’s replacement. Duquette also signed Manny Ramirez to an eight-year, $160 million contract, one long-term deal that actually worked out. Duquette pulled off one of the best deals of the 1990s when he got Varitek and Lowe from Seattle for Heathcliff Slocumb. Duquette signed Johnny Damon, another free agent deal that worked out, but lost Mo Vaughn to bigger dollars in Anaheim, though Vaughn’s career spiraled downward because of injuries. Duquette took great satisfaction when the Red Sox won the 2004 World Series, because so much of the core of that team was brought in by him. Besides Tillman, the Orioles have gotten great work from Miguel Gonzalez. Bud Norris has discovered a changeup. Wei-Yin Chen has been a consistent winner. The Orioles found a closer from within in lefthander Zach Britton. They have turned journeyman Steve Pearce into an offensive force. They’ve overcome not only the loss of Wieters, but so far the loss of superstar third baseman Manny Machado, and a down year from Chris Davis, at least compared with his 53-homer season a year ago. Of course, Duquette might have made the signing of the offseason — Nelson Cruz — who became one of the more feared power hitters in the league. How far can the Orioles go? All things considered, with the loss of major positional players, one wouldn’t think very far. But the Orioles have a solid, powerful lineup led by Adam Jones, the steady Nick Markakis and J.J. Hardy, and strong contributions from Delmon Young, Ryan Flaherty, and David Lough. Not many people, 10 years out of the game, get the chance to utter those words. It was tough for newly fired manager Bo Porter and bench coach Dave Trembley, who taught the game the way it’s supposed to be played, to make their way through the loads of data provided by the analytics people on the Astros’ staff. For that reason, GM Jeff Luhnow’s next hires need to be data savvy and put numbers ahead of traditional baseball. They need a manager who is OK with the daily interference, who knows his way around a laptop, and who gets the sophisticated shifting this team does on a daily basis. Because Porter and Trembley didn’t get it, they questioned it, and they are now unemployed. None of it blindsided Trembley, who found out about his firing from the ESPN news ticker, but he really knew once Porter was fired, because he was Porter’s guy. Trembley was the Orioles’ manager when that organization struggled to field a competitive team. So he understands struggles. Yet Trembley, who has devoted 40 years of his life to the game, was never sought for advice on a player. The final plan for each player seems to be on a computer printout somewhere. The Astros may be ahead of everyone when it comes to statistical analysis, but the growing pains have hurt some people. And that’s where the Astros have gone to the extreme. 1. If Yu Darvish finishes the year on the disabled list, the Rangers can deduct $5,228.75 per day in bonuses over 30 days on the list. Darvish could lose $135,947.50 from his $800,000 roster bonus if he stays on the DL. 2. Major league teams spend, on average, about $2 million for charter flights and fuel. More for East Coast and West Coast teams. 3. Don’t forget, the Red Sox have a player to be named coming from the Cubs for Felix Doubront, who made an impressive first start for Chicago. Could be a decent prospect. 4. Justin Verlander’s contract is just adding to the belief that you don’t give big deals to older pitchers. Verlander is 31, and his velocity and ability to dial it up is fading. He is part of a growing list of pitchers who fade after they sign big contracts (hello, CC Sabathia). That doesn’t mean Jon Lester, Max Scherzer, and James Shields won’t get a lot of years and dollars. There are teams who still can’t resist the temptation and feel it’s the cost of doing business. 5. The Tigers were one of the teams who asked about Koji Uehara at the trading deadline. Imagine if they had done that? 6. I see Jason Grilli in the Sox bullpen in 2015. 7. I also see an attempt by the Red Sox to sign Justin Masterson. The key is Masterson’s knee problems being solved by surgery or rest. 8. The Rays have turned 78 double plays — 14 fewer than any other team in the majors — while their opponents have turned 135. The Rays are on pace to turn 90 double plays, which would be the fewest by any team in a non-strike-shortened season since the advent of the 162-game schedule. The 2012 Padres (97) hold that distinction. 1. Jung-ho Kang, SS, Nexen Heroes (Korean) — Kang is going to get posted for a major league job. The righthanded power hitter, who has 38 home runs and 107 RBIs in 107 games this season, is 27 years old and will stay at shortstop or convert to second or third base. He’s listed at 6 feet, 180 pounds, but he looks bigger. The Cardinals were interested early, but a few teams have been added to the mix. Kang has major power and with the absence of it in the majors, he should get some serious money. 2. Victor Martinez, DH, Tigers — We’ve seen reports of White Sox interest, and they should be legitimate with Paul Konerko (retirement) and Adam Dunn (traded to Oakland) off the books. The White Sox were interested the last time around, but Martinez signed a four-year deal with Detroit. The Orioles, Blue Jays, and Athletics are all expected to have interest, but don’t bet against the Tigers retaining Martinez, who is having one of his best offensive seasons. Of Martinez’s 29 homers, 28 have come with the difference in the game three runs or fewer. 3. Yovani Gallardo, RHP, Brewers — There’s a $13 million option on his contract for 2015. Do the Brewers pick it up? It may seem like a no-brainer, but there’s some pushback by some in the organization, feeling the Brewers might be better off spending the money elsewhere. 4. Bud Selig, commissioner — The Veterans Committee should vote Selig right to Cooperstown when his term ends in January. Selig is eligible for induction already. He made the game extremely profitable, started and stiffened penalties for PED use, expanded the playoffs, and promoted labor peace. On top of it all, he’s a compassionate human being. 5. Jose Bautista, RF, Blue Jays — The Rangers need a righthanded power hitter for 2015. Don’t be shocked to see them engage in talks this winter with the Blue Jays over Bautista. The only problem is the Rangers are looking for two starting pitchers, as are the Jays. They may not fit in that regard, but the Rangers certainly have prospects to give up. 7. Joel Hanrahan, RHP, Tigers — Hanrahan wound up making $1 million for his failed comeback attempt with the Tigers from the Tommy John surgery he underwent with the Red Sox in May 2013. Hanrahan suffered a setback in July while working out in Lakeland and was shut down. No further surgery will be required, according to a source familiar with Hanrahan’s condition. He will try another comeback next season after resting the elbow. 8. Joe Maddon, manager, Rays — Maddon will enter the final season of his contract in 2015. What awaits after that? The affable manager, considered one of the best in the business, is being paid middle-of-the-pack money (about $2 million a year). He would be one of the more sought-after managers if he and the Rays can’t come up with a market contract, which at this point may be twice what he’s making. From the Bill Chuck files — “In August, no pitcher got batters to chase more pitches out of the strike zone than Jake Peavy, who did it 122 times.” . . . Also, “Brandon Moss is only hitting .180 since the All-Star break and .167 since Yoenis Cespedes was traded.” . . . Happy birthday, Joe Rudi (68), Darren Bragg (45), Sergio Valdez (50), and Mauro Gomez (30).